The older the plant, the more developed the root system. That’s what make a BIG difference in your landscape. Buy the biggest plant you can for immediate impact in your landscape. Our nursery production has changed over the years. Every industry is pushing innovation, and the nursery trade is no different. As more plants are being grown in pots, production innovations were being trialed. At Nature Hills, making new roots that are healthy and branch well is our goal. Nurseries and growers are always looking for new products that will make the best roots for their plants right from the start. New container options were offered with improved designs with slits or ridges that might assist the plants in producing a better root system. The shape and size of the pots we use have changed due to ongoing research. In addition, our nursery plant containers must be strong, flexible, label compatible and cost-effective. We protect our plants very well for shipping. Keep in mind that most container grown plants used to be grown in quart pots, 1 gallon, 2 gallon, 3 gallon, 5 gallon, and 7 gallon sizes. However, with competition comes changes. More sizes and styles of plastic containers began to be offered by the container companies, which were soon patented. Now, companies produce pots that span a range of volumes and have moved away from true gallon sizes to better suit the root production needs of specific plant genus and species. Most nurseries then began labeling them by broad ranges, including #1, #2, #3, #5, #7 to communicate or help buyers visualize the size of plant being sold across this range of volumes by class. With that change, consumers began to question the sizes of the containers. Plants might be listed as a 3 gallon plant but the volume of soil in these pots was not consistent. The NCWM Uniform Weights and Measures Law was enacted to help eliminate some of these inconsistencies in container size across the industry. They were looking for uniform packaging and regulation on labeling. This law was put into place to bring some continuity to the industry. The reason for this law is to help the consumer in comparing similar products by using uniform and consistent quantity information on the product package, or in advertising and signage. The regulation forces the container producers to list their volume in both U.S. and metric measures, the contents, and either the common or botanical names or both. 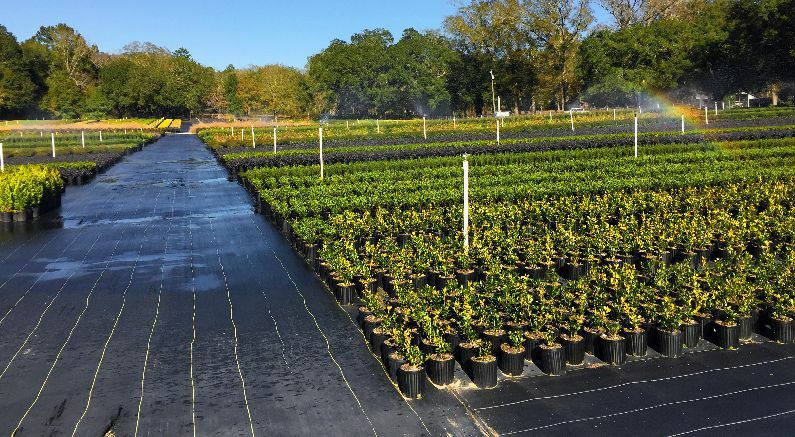 New signage and labeling practices in the nursery industry affected the business all along the supply chain - from container producers, growers, label manufacturers to plant branding firms and eventually the retailers. Now, within a compliant industry player, every potted plant you buy will have the volume of soil in that pot listed somewhere on it or it will be readily available from the grower. So, How Big is the Plant Grown in These Different Containers? So now you know about containers. But you still don’t know the actual size of the plant growing in the pot! Well, that’s a little bit harder to answer. Read on with us for the rest of the story. As a nursery and grower, we know the many things that can affect the physical size of each plant that we offer. Some of the size differences are based upon the time of the year, pruning methods and timing, or variances from grower to grower or to different regions. Think about shipping a dormant Bleeding Heart perennial in a #1 container in a March shipment. That plant would not even be showing any growth above ground yet, but it would just be a pot full of soil and roots. Now ship that plant in May and it might be 18” tall and flowering. What about shipping a Bleeding Heart perennial in a #1 container in October? It may have gone dormant again and appear to be nothing more than a pot filled with soil and roots. In all three shipments the size of the pot, and the volume of soil in it was exactly the same, but the size of the plant varied depending upon the time of year it was shipped. The weights and measures labeling is in place as a #1 pot, but the plant size is not consistent. The pot size dictates the volume of soil mix that was used to grow that plant. When a grower is producing a new plant in a container, the size of the root system and age of the plant has to be matched to the container size that is being used to grow that plant. Container size has more to do with the age of the plant, than the physical size of the plant growing in that pot. In many cases, if a small plant is placed in a pot that is too large for it, the growth is negatively affected. If there is too much soil in the pot, it may not dry out quickly enough for the plant to use the water as it is needed. That excess water can cause the roots to rot, and the plant to die. Conversely, in a pot too small, the roots become overcrowded. If roots are crowded, the soil may dry out too quickly. The plant may stress because the moisture is used up before receiving additional water. At our nurseries, our production personnel are matching the age and size of the plants to the size of the container they are being grown in. The size of the pot is in correlation to the age of the plant. Do keep in mind the example of the Bleeding Heart perennial shipment, and how timing can affect what you see at delivery. Our production facilities shift these plants to larger pots as needed. Nature Hills has a phenomenal group of growers that ensure we remain compliant with our labeling on container sizes and correct plant nomenclature. However, our concern goes deeper than mere compliance as we continue to grow and expand shipping across the entire country. Nature Hills is the leader in supplying healthy plants across the country to your doorstep, while remaining compliant for all state and local regulations. Why do we lead all other online plant suppliers in all categories? It is due to our commitment to excellence and dedication to plant health until it arrives safely to your home. We use an online service called Plant Sentry™ which only allows for the purchase of the correct legal size plant, depending on where it originates from. This is important to ensure that the plant leaves from the best healthy growing environment. The program also insures that each plant is labeled entirely correctly as guided by legal weights and measures, so you know that you are getting exactly what you paid for. Nature Hills has prepared a recent video that explains the plant age and the size of the pots they are being grown in. This should give you a better idea of the amount of work that we have into a plant.